Reports are floating around the web today, suggesting that Verizon has had a set of super secret Share Everything tiers for the mega-data hogs out there that they aren’t promoting. The fact is, that these plans have been there since day 1, Big Red has just limited their visibility to make life simpler for those switching to these new shared plans. While DL readers have known about these plans for some time now (we even listed them in our AT&T comparison), we thought it was a good opportunity to remind you about them. 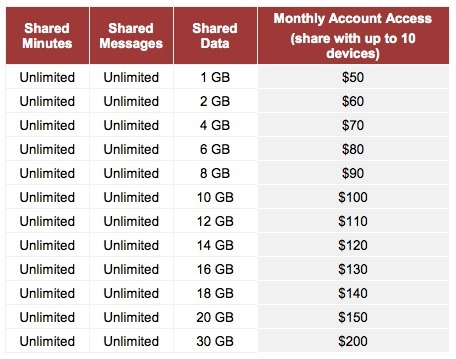 For those on Share Everything that imagine a time where 10GB of data at $100 is not enough, don’t worry, Verizon has more tiers for you to entertain. The next plan after 10GB is 12GB and will run you $110. The chart above details the rest, but as you can tell, there is even a 30GB plan for $200 in case you and your family plans on getting really wild some month. I would assume that Big Red may even go above and beyond 30GB if you need them to. To our Share Everything readers, I ask you, how are you liking your plan? Satisfied with tiers, pricing, etc. ?